Zamcart Is a versatile, low-cost trailer meant to be attached to a bicycle. It is primarily meant for agricultural use but customizations for many purposes can be requested by the customer. The cart has large wheels for rough terrain and can support up to 250 kg. It can attach to almost any bicycle. 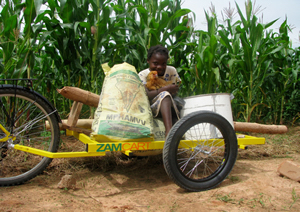 Zamcart is designed and manufactured in Zambia by Zambikes, a bicycle maker. Zambikes was founded in 2007 to sell bicycles in Zambia using the "social business" model wherein profits return to the community. The company is now moving into the international market with a new bicycle with a bamboo frame.